TheSamba.com :: Vanagon - View topic - Anyone have 85 TinTop AC with Subaru ? Anyone have 85 TinTop AC with Subaru ? Posted: Fri May 30, 2014 5:37 am Post subject: Anyone have 85 TinTop AC with Subaru ? Posted: Fri May 30, 2014 7:33 am Post subject: Re: Anyone have 85 TinTop AC with Subaru ? Hi, Paul. My '84 GL has that dealer-installed A/C. It puts a lot of cold air right where you want it. It worked well but I didn't like how much power the compressor robbed from the engine, so didn't use it much. Obviously, with a 2.5 that won't be an issue! 1. Check, with a proper gauge set, whether there is any refrigerant pressure in the system at all. If so, you are in luck because this means there is likely little to no contamination in the system since it was not open to the elements. 2. Remove all the refrigerant hoses and have them rebuilt with new barrier hose, using as much as possible, the existing VW fittings. Flush the components which you intend to reuse (evaporator and condenser). Use new O-rings everywhere. Note that the original hoses develop cracks and leaks from the inside out. External visual inspection will not reveal the hose condition. No 30-year-old hose will be useable and replacement is a must. You can save money by ordering bulk hose and crimping fittings yourself. 3. Remove and drain the compressor. Measure the amount that comes out and note the measurement. Check whether it was ever "converted" to R134A refrigerant. If not, then it contains mineral oil. Run clean mineral oil through it, turn the shaft and drain several times. This is done to clean it out. You cannot run solvents through the compressor, so this is the tedious method. 5. Clean the fins of the evaporator and the evaporator fans. 6. Check that evaporator enclosure drains are clear and repair as needed. 7. Replace the expansion valve on the evaporator. Nostalgic has them. You don't have to use a VW-spec unit - - the generic ones Nostalgic sells will work. 8. Replace the receiver-drier with new - - again, this is s generic item. 10. Even with a new condenser, I still recommend using Red Tek refrigerant. Since your whole system will be like new, do not use any "leak stop" products as they are not needed. Thanks for all your great advice Howesight. The hoses/lines were unhooked and full of crud so no doubt I'll get all new ones made front to back that will mate with Subie compressor. Subaru compressor will be late model, (engine is 2011) I think for around $100 new condenser makes sense, ditto on receiver/dryer and expansion valve. I'm just dreading the plastics in the ceiling, hopefully they don't disintegrate when I open up the evaportator. I guess I'll have to check the blower in the ceiling also and make sure it works then figure out how to flush the evaporator. At that point I'll have close to a new system. Didn't know about RedTek but it sounds more suitable for Vanagon than R134A. Posted: Sun Jun 01, 2014 7:19 pm Post subject: Install guide for early AC? 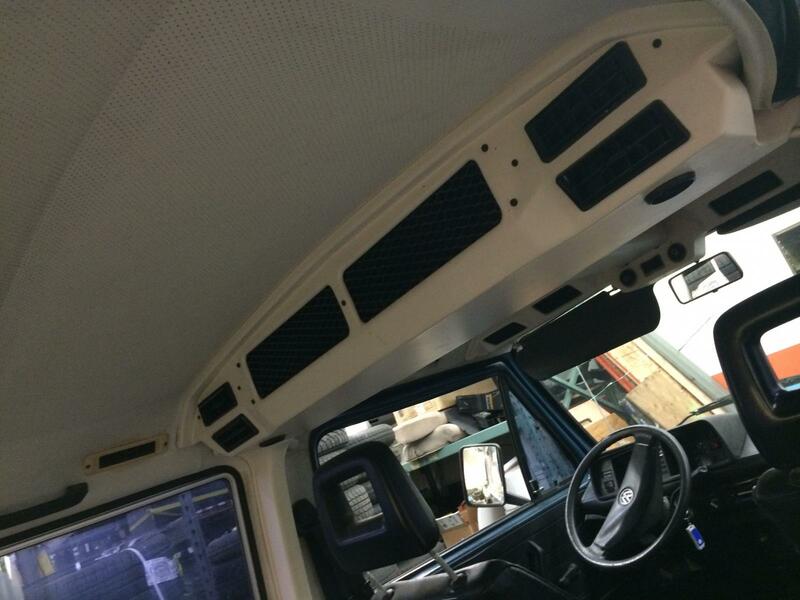 Has anyone come across the installation manual for this early Vanagon "dealer installed" AC system? If so, a scan/link would be wonderful. Posted: Sun Jun 01, 2014 9:46 pm Post subject: Re: Install guide for early AC? I take it back - I used to have a copy but I can't find it on my hard drive... I had a crash a few months ago and a few things appear to have gone missing. I do have the Behr In-dash A/C Manual. Posted: Thu Jun 19, 2014 3:45 pm Post subject: Source for expansion valve ? 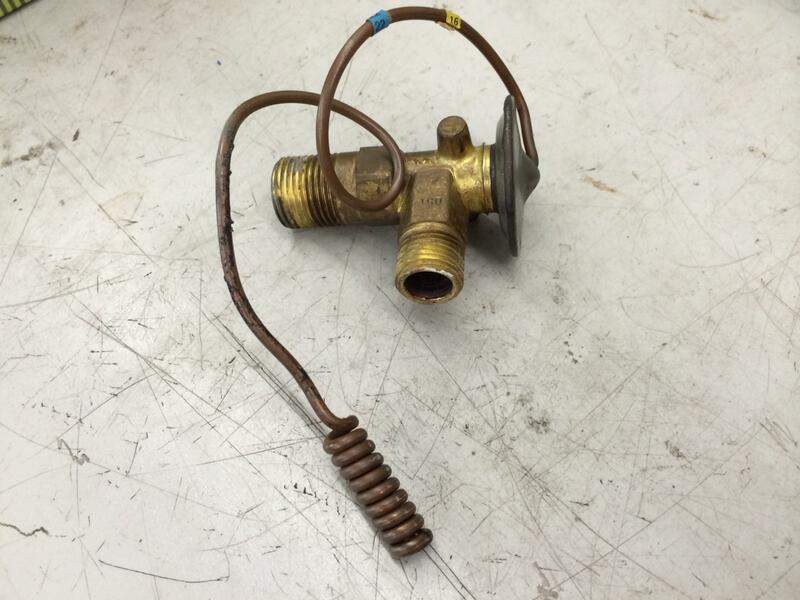 Where's the best place to buy a new one of these A/C expansion valves for the "dealer installed" 85 ceiling a/c unit? I want decent quality, I know there's $10 Chinese ones out there, but I don't want to replace it again anytime soon....it's a PITA to get to. Would this be a good kit to buy? I have one in my 85 too with a 1.8T, but I'm not much help in regard to helping you get it going. I can say it's not great by a long shot, but on hot days it is far better than not having it. Posted: Thu Jun 19, 2014 5:05 pm Post subject: Re: Source for expansion valve ? The unit in the link above is good quality. Nostalgic Air uses a lot of old-school technology (as opposed to the electronic controls, for example) in their kits to service the hot-rodder segment of the DIY AC market. They sell the good stuff, unlike some parts jobbers who will never see you again. Posted: Fri Jun 20, 2014 8:58 am Post subject: Re: Source for expansion valve ? If the capillary tube is intact, you probably don't need to replace it. If you look at the one end you will see two set screws for adjusting it. I imagine you could just clean it out and put it back into service. They would clog during a component failure and be replaced. At one time VW even had a cone shaped screen filter on the inlet, but in production probably realized it was better to not stop crud there and got away from that. If you are resurrecting and old system, I have seen inline filters you can add to the high side coming out of the compressor to catch any debris. If you can get the system flushed well, you would not need an inline filter. You gotta drop the center section of the AC. The expansion valve is near the drivers side tubes that run up the added inside pillar. 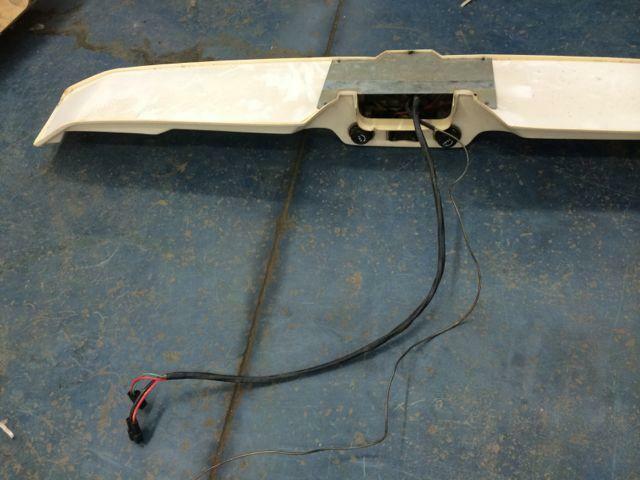 Easiest to drop the whole ceiling unit take it apart on the floor of the van. Start from front of van work back to remove. Helper makes it easier. Posted: Mon Aug 18, 2014 5:38 am Post subject: Where does "coat hanger" wire go? When I took it all apart I didn't note where the "coat hanger wire" goes. it is connected to the right dial in front and I know it goes down the center tube but where in the rear section does it go? Does it just sit on top of the evaporator fins or just hang out in the rear section somewhere? The capillary tube gets stuck on the evaporator with some strip caulking direct onto the coils--nowhere specific, just as long as it'll be able to read the temp of the coils. Don't try and clean out the expansion valve--you can, but whatever might be in there will get stuck at the dead end of the capillary tube & it wouldn't function properly if it's full of junk. There's no way outa there if whatever goo might be in there gets jammed at the end of the tube, and it will mess up the AC's operation. I meant the long wire that goes from front section to rear. But where do I set the other end of the "coat hanger" wire in the rear section? Posted: Fri Aug 22, 2014 7:51 pm Post subject: coat hanger location figured out! 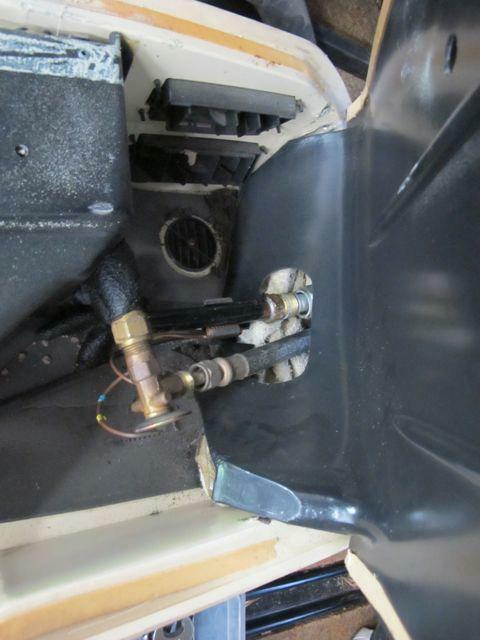 The evaporator end of the coat hanger goes into the hole in the black plastic evaporator cover, see photo above. The small hole is only on one side of the black cover, and there's a corresponding hole on the big cover piece. I'll post pictures once it's all back together. Now I need help with the electrical bits. 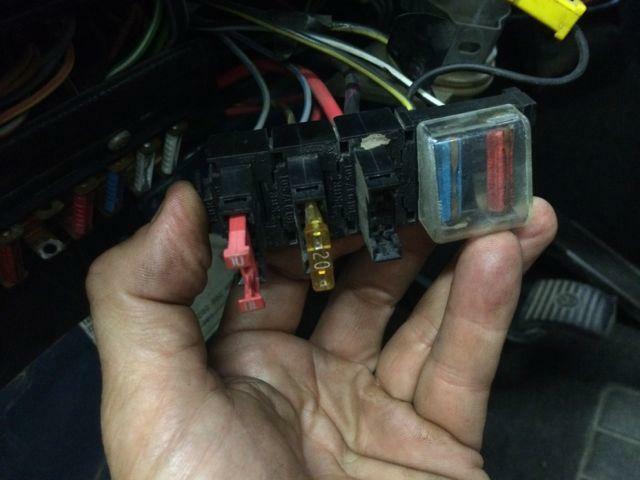 Is this extra fuse panel beside the main dash panel related to the aftermarket A/C? If so, what fuse is missing to the right of the yellow 20Amp fuse? Also, in the engine bay it appears only one wire is AC related. I think it simply went to the AC clutch. However, later model "factory air" Vanagons had two wires, one for AC clutch, I think the other to increase idle when AC was on?? Any advice how best to integrate the VW aftermarket AC wiring with Subaru wiring? 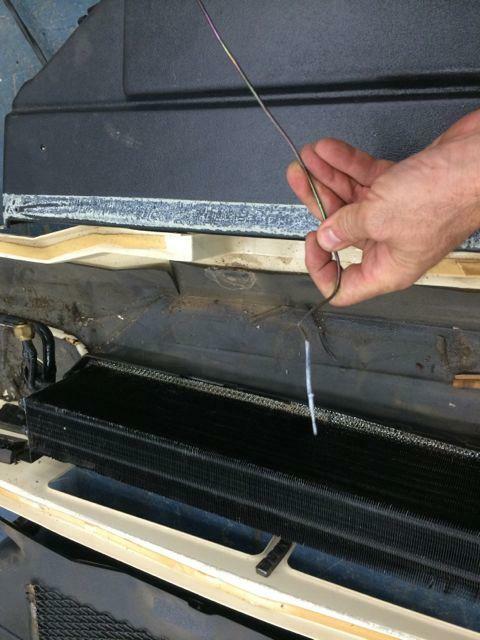 Posted: Sat Jun 04, 2016 10:34 am Post subject: Re: Anyone have 85 TinTop AC with Subaru ?